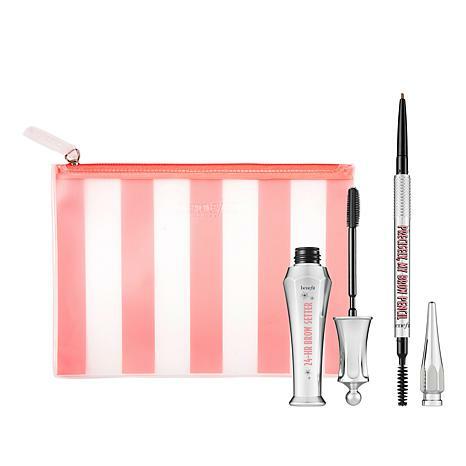 Achieve full, fast and feathery brows with this set from Benefit Cosmetics. It comes with a chic travel bag to keep all your goodies together. BENEFIT 24 HR BROW SETTER .23 fl. oz. Ingredients: AQUA (WATER), ALCOHOL, ACRYLATES COPOLYMER, AMP-ACRYLATES COPOLYMER, HYDROXYETHYLCELLULOSE, PHENOXYETHANOL, PEG-12 DIMETHICONE, CAPRYLYL GLYCOL, PANTHENOL, BUTYLENE GLYCOL, GOSSYPIUM HERBACEUM (COTTON) EXTRACT. 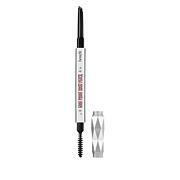 BENEFITPRECISELYMYBROW MED BROWN3 .002 oz. Ingredients: STEARIC ACID, RHUS SUCCEDANEA FRUIT WAX, HYDROGENATED CASTOR OIL, CERA ALBA (BEESWAX), CERA MICROCRISTALLINA (MICROCRYSTALLINE WAX), PARAFFINUM LIQUIDUM (MINERAL OIL), HYDROGENATED COCONUT OIL, HYDROGENATED PALM KERNEL OIL, ALUMINUM HYDROXIDE, HYDROGENATED PALM OIL, TOCOPHEROL, TALC, LECITHIN, BHT. [+/-: CI 19140 (YELLOW 5, YELLOW 5 LAKE), CI 42090 (BLUE 1 LAKE), CI 77007 (ULTRAMARINES), CI 77163 (BISMUTH OXYCHLORIDE), CI 77288 (CHROMIUM OXIDE GREENS), CI 77289 (CHROMIUM HYDROXIDE GREEN), CI 77491, CI 77492, CI 77499 (IRON OXIDES), CI 77510 (FERRIC FERROCYANIDE, FERRIC AMMONIUM FERROCYANIDE), CI 77742 (MANGANESE VIOLET), CI 77891 (TITANIUM DIOXIDE)].